There are many possibilities in learning and experiencing around eating and drinking. What is good for me, what is good for the environment, the climate? In Module 2 you find a lot of valuable knowhow and advice to raise food quality in kindergartens. But: increasing requirements can lead to more pressure, what´s not our objective. If children feel misunderstood, not respected, controlled or even humiliated by rules and how they are communicated, it´s very bad for their relation and development. Kindergarten staff has to be cautious but also clear in defining, what is really important about food, eating and drinking and pass this along to the children. Research has shown that the eating behavior of parents but also of kindergarten staff has a major impact in children´s behavior. 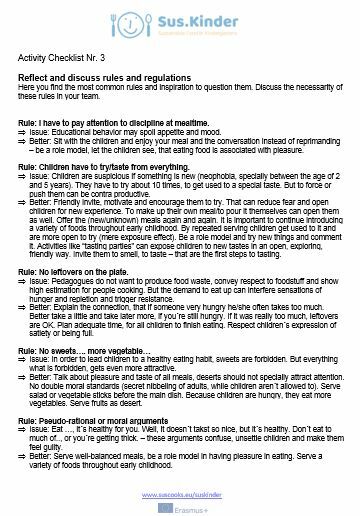 So, it is a matter of being authentic and emphatic in working with children – always and therefor also at the dining table. What is the intention behind the rule? Could this object also be achieved without this rule? What´s better in having this rule than having it not? To scrap outdated rules can be very relieving.